Banana nut bread is one of my all time favorites when it comes to baked goods from the kitchen. My step-mom and dad used to give everyone on their lists a selection of breads, including pumpkin bread and banana nut bread, in a basket each Christmas. It was one of my favorite gifts. 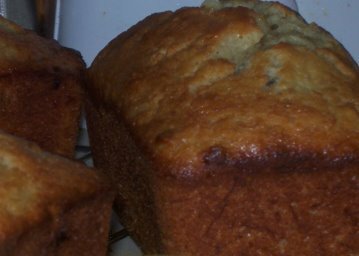 The banana nut bread recipe below is one I have used for many years. I don't remember where I got the recipe, or when I got it, but it makes truly delicious bread. Not too sweet, but sweet enough to satisfy. Mix well and pour into a greased fluted Bundt cake pan. Bake at 325degrees for 1 hour. Check with a toothpick or a knife for done-ness. When inserted toothpick or knife comes out clean, the bread is done. Remove from oven and allow to sit in pan for 10 to 15 minutes before turning out onto a plate or platter. This recipe works well baked in loaves, too. Grease and flour two loaf pans. After baking for 1 hour check to see if the bread is done. Do you like to bake homemade sweet breads, too?